First Day of My Life: Sprint Customer Service Issues - Round TWO! Sprint Customer Service Issues - Round TWO! Back in March (yes, five month ago) I mentioned some issues with Sprint Customer Service. My bill goes up ANOTHER $12.50 a month after less than 30 days ago was promised IN writing it would be the same price for the remainder of my contract. An hour and a half phone conversation - shuffled from people to people - and waiting to hear back from Sandy at 757-223-3916 - I have been the coolest, laid back - no cursing, no yelling client for over 15 years - paid in full every month and I know algorithmically - I fall within the top 5% of your consumer base and would love to just have some CONSISTENCY. Every time I call - I am told one thing and then what is delivered is completely opposite. I have not threatened to cancel - even though Breanne transferred me to Daniel who started the convo by saying - "I hear you are canceling." NEGATIVE, captain. I am not and what is going on within your company to have such broken communication from one person to the next? On July 18th, Justin took off $12.50 from my bill that was to come off every month until the remainder of my contract. I go to pay today and the $12.50 is back on. What is going on?? Becky, throws me to Breanne, who throws me to Daniel - who ends up hanging up on me - THANKS COACH! So after 15 years of service and bills paid in full every month ahead of time - I am now awaiting either Ericka or Paul to call me back - The JEDI KNIGHTS - who, from what Daniel says, "aren't going to do anything anyways." What to do guys? Appreciate the service, run around and 2 hours wasted on from what Daniel says - crying about $12.50. Well, it isn't about $12.50 it is about $240 (plus!) that will add up over the months. Sprint has already gone up $20 on me in the midst of my contract (lost that battle back in March) and less than 30 days ago, accepted the measly $12.50 a month credit as a resolution and figured I would just write off the rest. BUT now...WAMOOO HUNG up on by Daniel the great! Smooth move Dan. Thanks. I hate when sprint does this! They have the worst customer service lines. ughh! I would stick to your guns and keep pushing for something free. You deserve the answers to your questions! I used your button on my side bar! That is terrible! Hope it gets resolved soon! STICK WITH IT! Don't let them run all over you! Tweet it EVERY DAY, TWICE A DAY. Tag them on Facebook. Etc. Social Media is your friend in this situation! Get people to HEAR you and JOIN you. A crowd makes more noise than a single voice. ALSO! Switch to Verizon. I've never had this issue and their customer service has always been EXCELLENT! :-) But don't do that if you'll be penalized by Sprint. I love Vin's sign by the way! Big fan! Be your own advocate since apparently Sprint won't do their job and give you QUALITY customer service! that is absolutely terrible! I think my phone bill is HALF that and a little less for two phones on verizon. if they keep this up, you really should just switch service providers. Sometimes being nice on the phone doesn't work. Do you want me to call and pretend I'm you? I've gotten a free designer handbag before because people don't know how to do their jobs and because I don't tolerate the crap. BUT I've also completely canceled services when I've threatened. Wow...that's just awful. It makes you even more thankful for good experiences. I hope all of this gets resolved soon. Cami, have you tried going down to your local Sprint store and asking to speak to a manager there? Sometimes the only way you get results is in person. 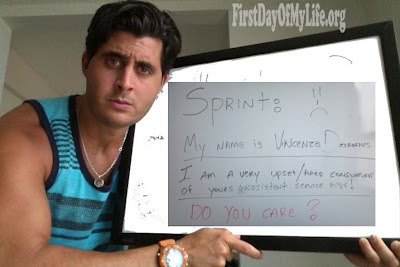 However, I have read article after article over the years about how terrible Sprints customer service is. (A couple years ago, they terminated several hundred contracts of "problem" customers); I would strongly advise that you consider switiching carriers when your contract ends. I didn't know that they were allowed to change your prices...aren't you "grandfathered in"? I sometimes complain about Verizon, but overall I LOVE them. I have great service, my bill is almost (one mess up in ten years) always right, and when there is a prob they are happy to fix it! Good luck and I hope you get it all figured out! ugh, that is horrible. steve can't stand sprint. i am so sorry. it's so obnoxious that they raised your charges without any notification! !